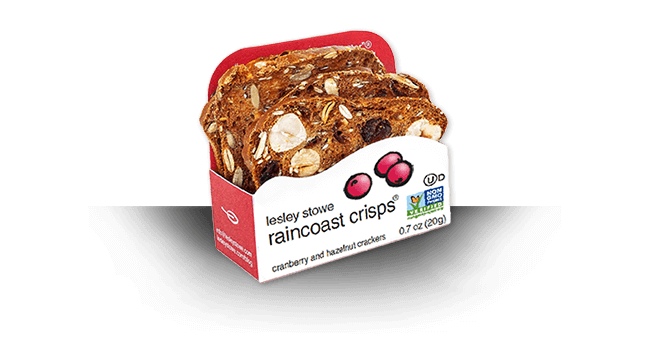 The sweet and toasty flavor you love in our cranberry and hazelnut raincoast crisps® is now available in a convenient and portable mini pack. The perfect snack to grab on-the-go! The sweet and toasty flavor you love in our cranberry and hazelnut crisps is now available in a convenient and portable mini pack. The perfect snack to grab on-the-go! Ingredients: unbleached enriched flour (unbleached wheat flour, niacin, iron, thiamine mononitrate, riboflavin, folic acid), dried cranberries (cranberries, sugar, sunflower oil), pumpkin seeds, flax seeds, hazelnuts, brown sugar, organic skim milk, sesame seeds, leavening (baking soda), refinery syrup, sea salt, honey, citric acid. Contains milk, wheat and hazelnuts. may contain other tree nuts.